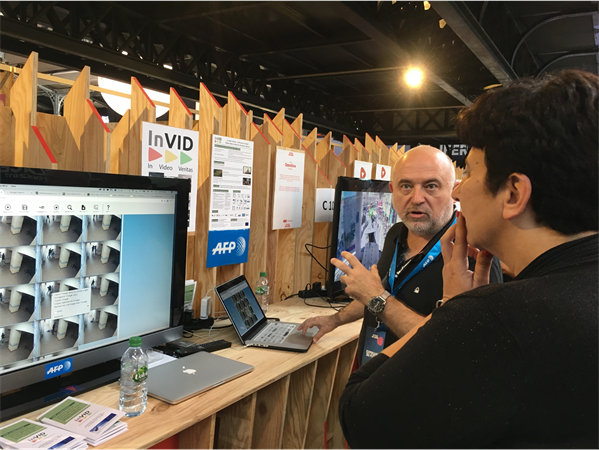 The newly appointed French minister of Higher Education, Research and Innovation, Mrs Frédérique Vidal, visited on Thursday June 8th the InVID booth at Futur en Seine Digital Festival 2017 (see central image above) where she was shown prototypes aiming to debunk fake videos. In particular, Mrs Vidal was shown how the fragmentation service, extracting relevant keyframes from a video, could help to debunk quickly a viral video shared during the French presidential elections by extremists xenophobic Facebook pages, claiming that a migrant seeking free universal healthcare assaulted a nurse and other employees in a public hospital. The image reverse search demonstrated in a few clicks that the video was in fact taken one month earlier in Novgorod, Russia, and was showing a drunk man hitting there the hospital employees. Once the video was debunked within the CrossCheck initiative led by First Draft News and Google News Lab on the French election (check the report about the debunking here), it was removed from Facebook but after being seen more than seven millions times. With the help of the video fragmentation and reverse keyframe search tool was shown that the video was in fact taken one month earlier in Novgorod, Russia, presenting a drunk man hitting the hospital employees. The recent presidential election raised deep concern in France about the fake news spreading on social networks. French president Emmanuel Macron himself complained shortly before his victory that «the social networks hurt me a lot» through attacks from hardliners extremists.